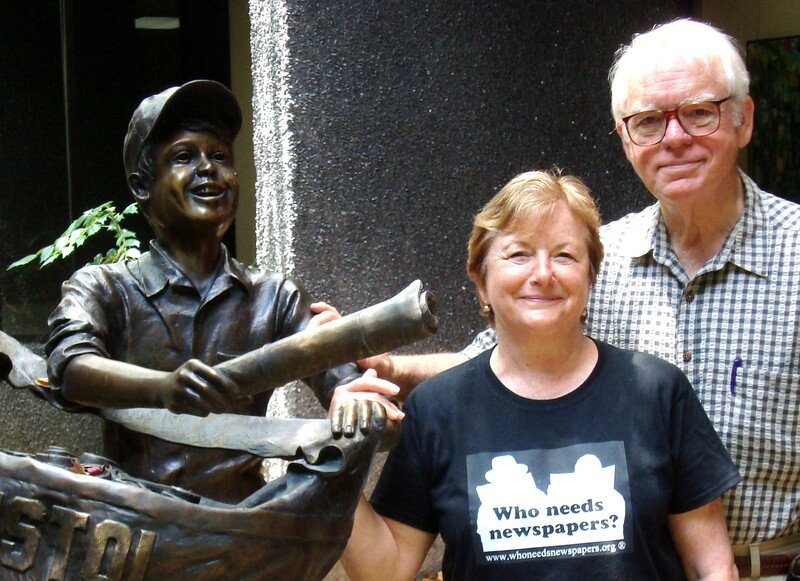 Paul Steinle and Dr. Sara Brown created an extensive website for their project, which they called “Who Needs Newspapers?” And they followed that up with a new book, “Practicing Journalism: The Power and Purpose of the Fourth Estate” (Marion Street Press 2014). In a column requested by Densmore Associates, Steinle and Brown relate below their work to Worcester, Mass., where The Telegram & Gazette may soon be sold by new owner John Henry, publisher of The Boston Globe and principal owner of the Boston Red Sox. By Paul Steinle and Sara Brown, PhD. Based on our research and our experience, Worcester would be well served by some sort of local newspaper ownership – assuming that ownership is professional, connected to the community’s interests through residence or some strong regional connection, and funded well enough to ride the waves of various business cycles. More than 30 of the 50 successful newspapers we visited in compiling our www.WhoNeedsNewspapers.org research were locally (or regionally) owned or controlled. Those newspapers — as large as the Seattle Times and the Tampa Bay Times and as small as the Aurora (Neb.) News and Register — reflected certain key characteristics. 1.) Locus of control/local peer pressure — The decision-makers in these transformational newspapers (Internet-connected, multi-platform, multimedia news organizations) all were tied to the local communities in which they operated. Owners and or publishers attended local Rotary club meetings, or local churches or they had kids in local schools. And, of course, they had a stake in the local economy. As a result they cared about their communities. And the communities, through these interactions, held the owners responsible for the content of their newspapers. 2.) Independence/Financial Flexibility — Since the ownership is locally (or regionally held) and the ownership is often private and or family or institutional. This kind of ownership is not beholden to the stock market. As a result, the ownership has greater flexibility in managing its budget and its expenditures. That can make them more vulnerable when local economies tank, but in normal or good times, they can decide where to invest their funds more quickly and make adjustments more swiftly if they need to. Needless to say, a local owner can decide, independently, what is a fair profit (operating margin) for a given period. Newspapers in past years (up until the mid 2,000s) often enjoyed profits of 25-30%. The newspapers we visited (2010-11) were experiencing profits in the 5-10% range. That’s still a viable margin, but when you have a board of directors and stockholders expecting 25-30% returns, they often demand cuts in staff and reduce reporting power to maintain historic profit margins. Those are a few of the advantages of local ownership versus corporate and or public, market-driven ownership. Having said all that, newspapers (and especially transformational newspapers because they are exploring new territory) require a complex balance between commerce and community service to operate successfully. So, intelligent, seasoned journalism/business management leadership is critical to the formula. But the enterprise is worth the stakes required for a community. As one local editor/publisher/ owner told us, his family’s newspaper is “the glue” that holds his community together — the local newspaper is the community’s bulletin board, the local marketplace of ideas, and “the mirror that reflects each community” back to itself. These are exalted metaphors, but they are apt. Communities are served by local, professionally trained, ethically-centered journalists, and newspapers — a unique news and information medium — hire these people and keep them serving those communities by keeping local citizens informed about where they live. If the people of Worcester are interested in keeping control of their newspaper locally, they need look no farther than The Day in New London, Conn. (or the N.E. Mississippi Daily News in Tupelo, Miss., or the Tampa Bay Times) to see how a non-profit, foundation-controlled newspaper can operate. And these are great examples. This entry was posted in news future. Bookmark the permalink.